Christmas is coming closer, and I was looking forward to giving you some inspiration for gifts for yourself or your friends. Let's start with gift ideas for the home, because during the cold season home is the best place on earth and even better with a few little new additions. 1) Scented Candle: Cause every home needs luxury candles, and Fornasetti's are the best. 2) Copper Pineapple: We all love pineapples and cocktails, more questions? 3) Pink & Black Cotton Blanket: The lovely artist-designed blanket will keep you warm. 4) Iridescent Vase: This Tom Dixon vase makes your flowers even prettier. 5) Copper Cocktail Glasses: To go with the copper pineapple and designed by Tom Dixon. 6) Fluffy Hot Water Bottle: Every girl is craving for warmth and fluff during winter. 7) Tray with Hands: You are right on trend with choosing hyped label Toiletpaper. 8) Missoni Bath Mat: Forget boring mats and upgrades your bathroom in a single stroke. 9) Lalique Vanille Diffuser: Because girls are crazy for vanilla on the skin and in home. 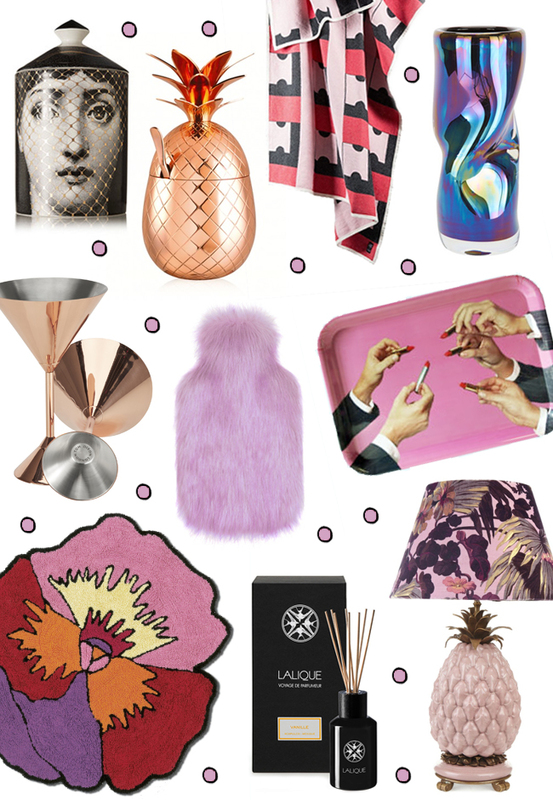 10) Pineapple Lamp: If you really wanna spoil somebody, House of Hackney is the best answer. Haven't you found your perfect gift yet? Stay tuned for more ideas coming soon.